This book is surprisingly controversial - something of a 'wolf in sheep's clothing'. I'll address this later in the review. 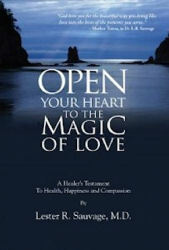 There are plenty of self-help books written by doctors, but few have such a strongly Christian message as 'Open Your Heart to the Magic of Love'. The author, 85, is a retired heart surgeon whose life has been unquestionably full and in many ways inspiring. He shares much of his story with the reader in the autobiographical section later in the book, opening his heart as an example to others. His own Christian strain is Roman Catholicism, and his overtly evangelical tendency would be considered unusual here in the UK - but I guess it's more normal in the States for Catholics there. It's when he mixes God and medicine that he crosses various ethical lines, which makes this book a more morally contentious one than it initially appears. On the face of it, then, Dr (or 'Mr', as surgeons are address in the UK) Sauvage presents an uplifting message of happiness through God's gifts, particularly the generosity of spirit towards others. He argues that the magic of love is the mystical power that lets our spiritual engines roar and brings joy to our hearts (p2). Inner happiness can aid the promotion of healthiness, and inner happiness is derived through making the world around us happier. He argues that miracles can be seen all around us, and despite the importance of science it does not capture the complete picture. He describes his own intellectual synthesis of science and Christianity, showing a tendency towards Intelligent Design, whilst curiously accepting the principle of Darwinian evolution. He cherry-picks a catalogue of evidence for the existence of a Creator, but then produces the trump card of the over-riding importance of Faith. "In my experience, many of my listeners [to his lectures] appreciated hearing about my generic spiritual views, yet were reluctant to reveal their own. In the early years of my open-heart surgery practice, I faced that same difficult myself. After interacting with plenty of patients over the years, however, I became less hesitant about revealing my personal beliefs and more skillful (sic) about weaving spiritual considerations into the fabric of larger philosophical discussions. Your see, what is missed here is the recognition that the author's (and others') unease about revealing his religious beliefs to his patients is due to it being considered professionally unethical. To be on the professional register to practice as a doctor, or any other professional health care worker, one has to abide by a strict code of conduct. Overtly promoting religion to your patients breaks that code - like sending patients home with a plastic St Francis prayer card, as Dr Sauvage used to do (p244). In Britain, one could be hauled up before the GMC or NMC and struck off for such activities. Even wearing a religious symbol gets health care professionals into trouble, let alone evangelising at the bedside of a critically ill patient. I can only assume that the author has encountered such (justifiable) criticism himself, and this polemic is his rearguard action. I, the reviewer, have been a nurse for over 20 years and have spent my professional life in the service of others. I am popular with my patients, and provide good quality care with compassion and thoughtfulness. I am also agnostic. I don't think one needs to be religious to act in the way the author prescribes - indeed, many patients would find an overt mix of medicine and religion difficult to assimilate. Spiritual support is offered by the hospital chaplains, if required. In my opinion, the positive traits described in this well-meaning book are innate to us all, and not a 'gift from God'. They are emphasised in the training doctors and nurse receive, and promoted through good practice in health-care settings. One does not need to bring religion to the bedside to create good patient outcomes. This mild-mannered and apparently bland book is striking for this one difficult area of argument. So controversial is this issue that most health-care professionals won't even go there, as the author indicates. Yet, he does not indicate why this is so contentious. Really, he should have rounded out this discussion with a broader debate about professional codes of conduct, the history and philosophy of medical ethics, and the politics of mixing medicine and religion. The lay reader is left in the dark regarding the wider context. It is clear that, like all religiously-minded folk, he knows that his religion is right, and thus believes that there can be no harm in advocating it to others, even those who he, as a doctor, has power over. Would he similarly support an evangelical Muslim, Jewish, Hindu or Buddhist doctor? He probably would, as these are established, mainstream religions. But how about a Spiritualist doctor? Or a Wicca doctor? Let's take this argument one step further - how would the author react if an atheist surgeon about to undertake heart surgery were to candidly say to his Christian patient that there's no God and no afterlife? My bet is that Dr Sauvage wouldn't be too happy, and would likely consider that atheist doctor to be grossly unprofessional. Subtitled "A Healer's Testament to Health, Happiness and Compassion"